The Quality Hotel Royal Corner enjoys an ideal location, within easy reach of the best of what Växjö and Småland have to offer. This hotel is the perfect choice for business meetings, family holidays and weekends away! All our guests can enjoy free access to WiFi, the gym and our relaxation area with a pool, jacuzzi and sauna. 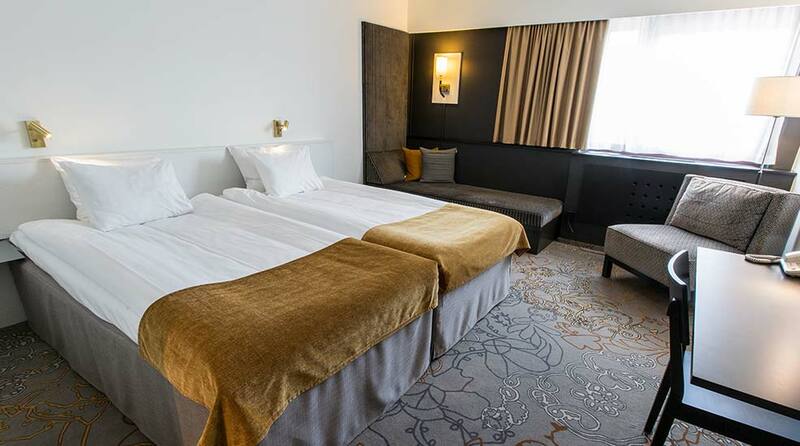 The Quality Hotel Royal Corner is centrally located, just a short walk from shops, restaurants, cafés and other attractions such as the Växjo Concert Hall and Växjo Theatre. Other destinations in the Småland area include the Kingdom of Crystal (Glasriket) with delightful handblown glass, and the Kingdom of Furniture (Möbelriket). Småland is home to a great many famous design brands, so you'll be sure to find plenty of inspiration! We have 160 well-planned and comfortable rooms here at the hotel. There are different types of accommodation to suit your needs including single rooms, double rooms and family rooms. All our rooms are equipped with free WiFi and smart TVs. We also have a few deluxe double rooms that have coffee machines, bathrobes and slippers. There are specially adapted rooms for disabled people, as well as a pet-friendly room for guests wishing to bring their dog. Please contact us for more information about our specially adapted rooms with easy access, our pet-friendly rooms and our deluxe rooms. Our conference centre has 10 conference and meeting rooms. The largest can accommodate up to 140 people and the smaller rooms are ideal for groups of 6 to 8 people. You can book big and small meetings, training sessions, seminars, workshops and board meetings. We collaborate with the La Castellina restaurant to cater for your event with delicious food and drinks. Our staff will look after you all day to make sure that your conference turns out just as you hoped. If you need help with a theme or are looking for ideas for group activities, we'd be happy to help! Take some time out from your busy schedule in our relaxation area. Our gym is equipped with a range of cardio machines and weightlifting equipment for you to work up a good sweat. End your session with a dip in the pool or the jacuzzi, and relax tired muscles in the sauna. Further information and opening hours can be found under Services. Good food and drink can make a hotel stay truly special. Every morning, guests can enjoy a large buffet breakfast with plenty of organic produce, and this is of course included in the price of your room. Lunch is served in the restaurant from Monday to Friday and in the evening you can enjoy something from our à la carte menu. Read more and book a table here. The Quality Hotel Royal Corner is an ISO 14001-certified hotel. We have also been accepted into the TripAdvisor GreenLeaders programme. Quality Hotel Royal Corner is cash-free, which ensures added security for our guests and visitors. More information about this can be found under FAQs. To ensure that your stay in Växjo is as enjoyable as possible, we would like to share our tips on activities and places to visit. The reception is open all day, every day, so you can always ask one of our members of staff for advice. You can read more about Växjö here. We hope you're going to enjoy your stay and we really want you to feel at home. Sit down and relax in our spacious lobby, get some work done, have a glass of wine or a beer, or just have a chat. Our lobby bar sells cold drinks, snacks and sweets. Welcome to the Quality Hotel Royal Corner, Växjö - a hotel for any occasion!